At 1845 on May 27, 1945, Ensign Tamotsu Watase took off from Kanoya Air Base as observer (included roles of navigator and bombardier) in a two-man Shiragiku trainer carrying two 250-kg bombs. He was a member of the Kamikaze Special Attack Corps Kikusui Unit 1st Shiragiku Squadron from Kōchi Naval Air Group. He died in a special (suicide) attack off Okinawa at the age of 22. He was from Tōkyō Prefecture, attended Nihon University in Tōkyō, and was a member of the 13th Class of the Navy's Flight Reserve Students (Hikō Yobi Gakusei). Have you been doing well? Have Masa and Chieko also been doing well? Thanks to you, I am more and more enthusiastic. The decisive battle at Okinawa has become increasingly intense. The day is near when I will carry out my original intention. I will certainly do it. It is inexcusable that I did not show any filial piety. Also, I have no regrets. There is nothing above this as the long-cherished desire of young Japanese man. I am very happy. Well then, I am going. I pray that you will have long life and great happiness. The letter on this page comes from Kitagawa (1983, 211-2). The biographical information in the first paragraph comes Kitagawa (1983, 211) and Osuo (2005, 241). Kitagawa, Mamoru, ed. 1983. 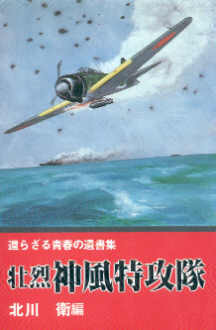 Sōretsu kamikaze tokkōtai: Kaerazaru seishun no isho shū (Heroic Kamikaze Special Attack Corps: Collected last letters of youth that would be lost). Tōkyō: Nihon Bungeisha.